Unsurprisingly, for he’s been living in Virginia Water in a massive detached house, he finds Liverpool’s anti-establishment ethos gives him perspective. On his return south he gatecrashes his wife’s dinner party (it is in his own house), drunk, and tells the pinstriped tossers what he thinks of them. The class tensions remind us that although the 1960s were more egalitarian than the decades before, as McGrath makes clear, the ‘old order’ is still in charge. Apart from the distracting zooms, Jack Gold‘s direction is confident. He shoots crowd scenes well and there’s a great moment at a wrestling match where the contestants suddenly realise that the audience has erupted into a riot. They stand together bemused, watching the mayhem. McGrath was born in Birkenhead which vouches for the authenticity of this portrayal Liverpool. You mention Performance as a film from the same ‘moment’ and that’s right in terms of the violent crime/gangster films about to appear in the next few years – Get Carter and Villain being two of the most high profile, both in 1971. Nicol Williamson’s energy and rage suggests the violence in those two films and especially in Get Carter which has the same plot idea of a Northern man returning home from his life in the South (though casting Michael Caine makes the film in one sense ludicrous). 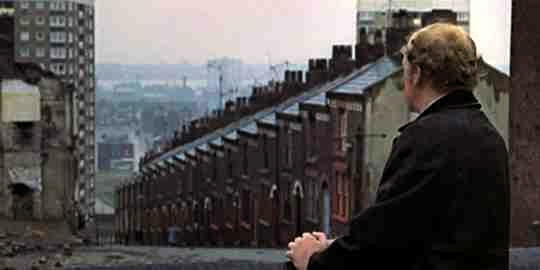 But the film I’m reminded of is Charlie Bubbles (1969) in which Albert Finney returns to Salford as a successful novelist who has lost his roots. There is a long history of migrations from the North down to London – and the difficulty of returning. But some of us made it back! btw I always thought Williamson was Irish. I’m not sure why – but it makes sense in the Liverpool setting for this film. I was surprised to discover that he was born in Lanarkshire and grew up in Birmingham.